The HP LaserJet Pro MFP M130nw is one of the smallest multi-function printers that the manufacturer produces, it includes a wireless connection, and the ability to print from a number of mobile devices, so producing high-quality documents is quick and simple. You can print, copy and scan all from this single machine, but it still manages to have a top speed of 23 pages per minute and include all the latest energy saving features. If you require a compact, but multi-function printer in your office, then the M130nw will bring many advantages to your business. This handy multi-function printer has maximum dimensions of 398 x 482 x 388 mm and has a standard 150-sheet paper input tray. The scanner is a flatbed version that is accessed from the top cover and can scan in colour up to 600 dpi, and monochrome documents to a maximum of 1200 dpi. The control panel helps you manage all your tasks, including scanning directly to emails, network folders or USB. 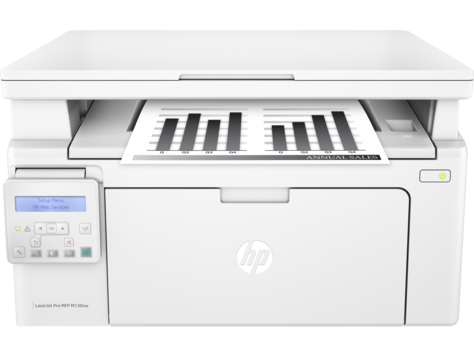 With the HP LaserJet Pro M130nw, you’ll be waiting less for your printed, copied or scanned documents and it can produce up to 23 pages per minute. Even when it’s using the energy saving technology it can warm up and print the first page in just 7 seconds. With the use of HP original toners, you’ll be gaining the maximum benefits from the M130nw and the auto seal removal makes the cartridges quick and easy to replace. This multi-function printer only produces black and white documents and doesn’t have the capabilities to send fax messages. There is no option to increase the paper capacity and the HP LaserJet Pro MFP M130nw has no finishing features.